Did you know that the world’s first toothbrush was a just a stick about the size of a pencil. One end was chewed into thus becoming softened and brush-like while the opposite end was pointed and used as a toothpick to clean food and debris from between the teeth. The twigs used were carefully chosen from aromatic trees that had the ability to clean and freshen the mouth. The earliest literature showing the use of these twigs is found in Chinese literature at around 1600 BC. It has now evolved into the toothbrushes we see today. 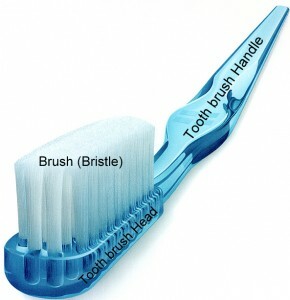 Nowadays toothbrushes can be broadly categorized into manual toothbrushes and electronic toothbrushes. This entry was posted in Oral Care and tagged best toothbrush, cross action toothbrush, soft bristle toothbrush, toothbrush, toothbrush brands, toothbrush materials, toothbrush price, toothbrush sizes, ultra soft toothbrush, whitening toothbrush on February 6, 2010 by samanthaloh. People with orthodontic braces require special and more detailed oral hygiene care as extra material or appliances fitted in the mouth acts as food and plaque trap. Although orthodontic appliances are extremely useful in straightening teeth, having braces will indefinitely make it harder to maintain standard oral hygiene care practices as extra effort is required to clean around the brackets and wire. Improper removal of plaque and food debris or poor oral hygiene care practices can make some people particularly susceptible to dental problems such as gingivitis and dental caries. Thus is it essential to use proper plaque removing agent such as a good orthodontic toothbrush to prevent plaque stagnation around tooth. This entry was posted in Oral Care, Toothbrushes and tagged best toothbrush, best toothbrush for braces, dentist recommended toothbrush, orthodontic braces care, orthodontic toothbrush, toothbrush for braces on January 23, 2010 by leekong.